Hi there! It's Devra here today. I've had these photos laying around for a while. We were riding a carousel. So I thought circles and came up with this cut file from The Cut Shoppe. I needed some circles to stand out more than others. Flair + circles is a no brainer! I used flair from a couple of different sets. Because yes! I like to mix things up! So I used 2 pieces from the Geoshapes set and one from the Minimal 2 set. I love color. Lots of it. The mini prints and bold color of the Geoshapes are so versatile and fit my purposes exactly. The Amy Tangerine papers I chose have 3 main colors, blue, green and yellow. The multi colors of the flair tie everything together. Magic. I love the yellow Happy piece from the Minimal 2 set so much. I should have several of those. I can use them over and over! Thanks for taking a look! I hope I've given you some ideas today! I have made it quite official on my Instagram page, but not on my personal blog. 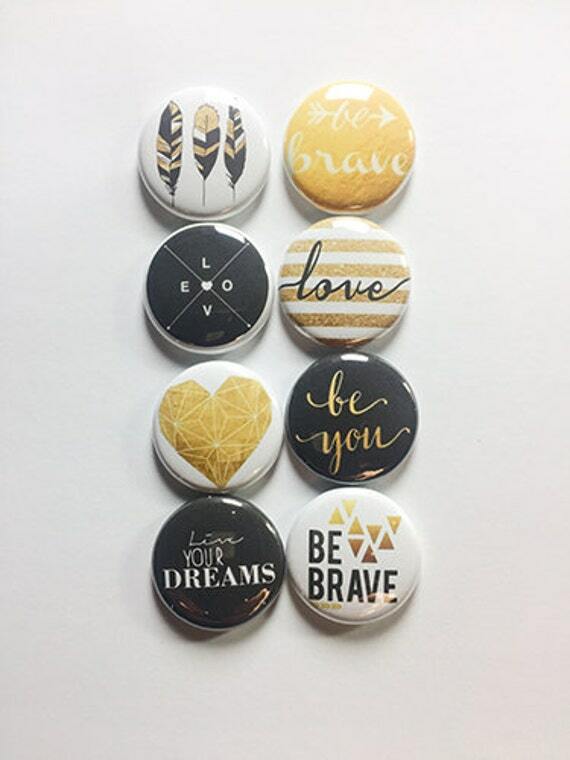 If you don't know, I'm one of the newest design team members for A Flair For Buttons - a quaint little Etsy shop containing a wide variety of beautiful, fun and trendy flairs. I've mainly used my flairs for my 52 Favorites projects, which documents my favorite story of the week for a year. But today I decided to add a little flair, (hehe), to this adorable layout. The set I used is called "Say Cheese 2" and can be found HERE. The layout itself is a sketch challenge for Paper Issues, and the "Star Gazer" Dear Lizzy collection. I still have mostly all of the pieces to that line, and am trying to make my way through it all. No more hoarding for me! Along with the diecuts and stickers, I was able to incorporate flairs from Shelley's Etsy shop. The colors match perfectly! Thanks for checking in today, and please be sure to check out the complete stock of flairs! This is one of those times that I started with the flair. I knew they matched these pictures perfectly, so I grabbed them and printed off my photos. I had these butterflies (white) on my desk from a previous layout -- I had cut them too small the first time, but I saved them because I knew I would use them. So, I started by creating a background paper using several Shimmerz Vibez mists that matched my flair. Then I used that background paper to cut butterfly shapes to go behind the cut file. Finally, I stitched with gold thread down the center. Between the butterflies and the flair, I didn't really need a whole lot of other embellishments. But I did grab a few items from several different Paige Taylor Evans' collections -- and I used "outside" from Color Cast Designs as part of my title. Believe it or not, I made a process video, if that suits your fancy! Moikka! It's Riikka here today to share a couple of spring cards with you. 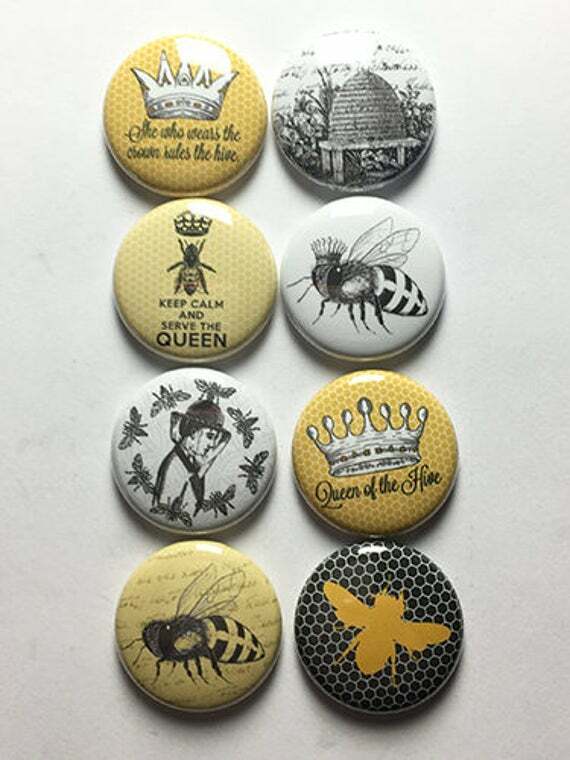 The inspiration to these came when I was looking through the flair buttons for my previous layout and had some Bee flairs, a pale blue bicycle flair and the lace looking yellow flair on the table next to each other. The color palette looked sweet and I thought to use that in some cards. I made these cards a bit differently compared what I normally do. I used white cardstock as my base and also cut the leaves and blooms out of white. Then I first colored the background with watercolors and inks, glued the leaves and blooms in place and added watercolor to them as well. As you can see the center of the flowers are flair buttons. The yellow is from "Sweet" set and the beehive is from "Vintage Bee 4". Thank you for your visit today! Wishing you a sunny spring or early summer! Hey everyone, Michelle here today with a new LO to share. I had a lot of fun with this one. Word flairs are my favorite. I think I had about 10 picked out for this LO! It was hard to choose but I finally settled on these 3. Paper is from the More Than Words collection from Cocoa Vanilla Studio, and the cut file is from Paper Issues. There really isn't a bad place to put flair on your LO. They're so easy to use. They look good wherever you put them. Hi everyone, Laurel here with another card. I have used the Baker 2 Flair set on my card today. Isn't that a fun set? I could see it used in recipe books, tags on baked good gifts, and of course layouts as well. As I said, today I have used them on a card. I went with a homespun feel, love that chicken wire die for a background when I am going for this theme. I tucked 2 of the flair onto the card as little accents. The canisters were paper pieced. It's Els here today. I've got a layout to share with you today. The pictures were taken on my son's birthday party a few weeks ago. I doubted about the pink for a bit, but since there were more girls than boys on the pictures, I decided to go with it. A lot of black embellishments make this layout less gender specific. The flair I used for this layout are from the Chalk Words 2 set and from the Just Words 2 flair set. Hello AFFB fans! It's Lee-Anne here and today I wanted to share a layout of my husband and son. It was my son's eighteenth birthday last October and his favorite band is Pink Floyd so we surprised him with a trip to Edmonton to see them in concert. I used two flair buttons from the Rock On 3 Flair Set that I thought would be perfect for this layout and one flair button from the Hello Weekend Flair Set for my layout. One can't have too many flair on a page and my motto is the more the merrier. I also used the triangle rule in design to place the flair buttons to draw the eyes around the page. Be sure and check out all the amazing flair buttons in the A Flair For Buttons shop. There are lots of new sets that have been added to the store. ..:: hello spring break ::..
And this flair from the Inspirational Words 1 Fair set fit PERFECTLY! I love the flower and the text background! Thank you so much for stopping by -- see you again soon! Hi everyone, Laurel here with a quick and easy card using the Hedgehog Love flair. This card could be used for any occasion even a just because. I embossed the cardstock with a woodgrain embossing folder - it works well with the button I chose don't you think? I fussy cut some clouds from pattern paper. Other than that, just simple layering of die cuts and strips of paper. Cardstock & embossing folder: Stampin' UP! Hi there! It's Riikka here today to share a layout with a step by step tutorial with you. This page is actually done in co-operation with my daughter. Let me tell you why. Last month my older daughter turned nine. I try to do a layout every now and then and document what my daughters think and what's their favorite colors, for example. So I took a little note card and got asking my daughter. I included the card in a vellum pocket behind the photo. I also wanted to use my daughter's favorite color at the moment (yellow) and her own hand-writing in the page. I started by doing a mixed media inspired background and then continued to layering and embellishing. As it's kind of a birthday page, I wanted to use happy colors in the page. If you want to see how the page was made, please see the step by step tutorial below! Step 1. I started the page by adding some yellow acrylic paint to the patterned paper and dried it. Then I passed the page to my daughter and asked her to write anything on it. Just to get her own handwriting in there. Step 2. Next I added some stamping to the page. Fist I added some yellow circles and then black script using two different stamps and inks. Then I added a piece of patterned paper to the page to back the composition coming on top. Step 3. Time to make the composition! I cut random pieces of patterned papers with the paper cutter, layered them behind the photo and stapled the layers together. One of the layers is a vellum pocket, which I was careful not to staple shut. Then I adhered the photo on top using foam dots and the cluster to the page with dots, too. Step 4. Time to add the lovely flair buttons! I gathered some flairs that would fit the theme and go to the page and then tried different ones here and there. I also added a paper clip to the photo to bring dimension on top of the shot as well. Step 5. Next I added a title. I was missing all the Es of my alphas and didn't want to use a three to replace one this time so I added a multitude of nines as the title. I used black and white together with the yellow. Step 6. I finished the page with the hand written journaling and some little drawings here and there. The main journaling is in the vellum pocket but I added some text visible as well. On a summer vacation a few years ago, my family went to the beautiful world renowned Butchart Gardens in Victoria, British Columbia, Canada. If you have never been, be sure and put it on your list. It has to be the most heavenly place on earth. I love to photograph flowers and the Dahlias were in bloom in July so I had to capture this beauty. The pink, blue and green flair buttons from the Watercolor Splatter Flair coordinates perfectly with the photo and patterned papers. I placed the three flair buttons in a triangle design to lead the eyes around the page. I am happy on how this layout turned out. 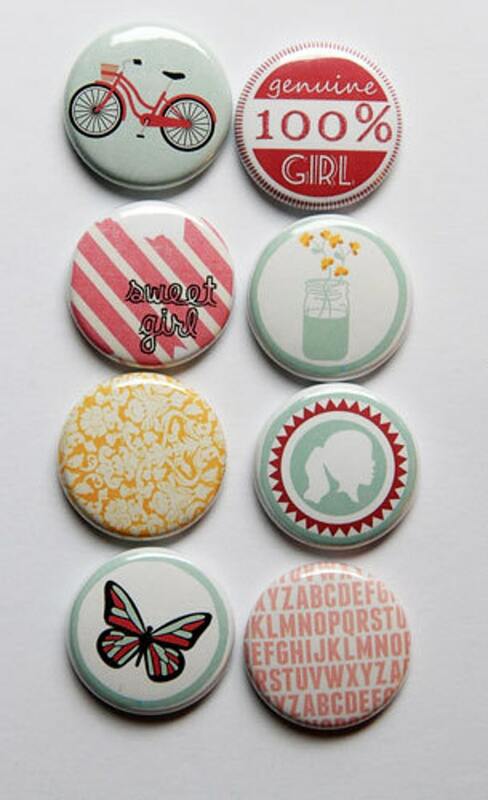 Thanks for stopping by and be sure to check out the A Flair For Buttons shop. To create these paper flowers, you need to cut a few 3d paper flowers either from a manual die and machine or a digital die cut machine. Assemble each flower per their instructions and add your favorite flair badge to the center of each flower. Add paper leaves by folding a length of green cardstock in half and cutting several sizes of leaves. Adhere all these items to your letterboard with removable adhesive like glue dots. For additional instructions, visit this blog post HERE. I used these darling flair badges HERE for this project. 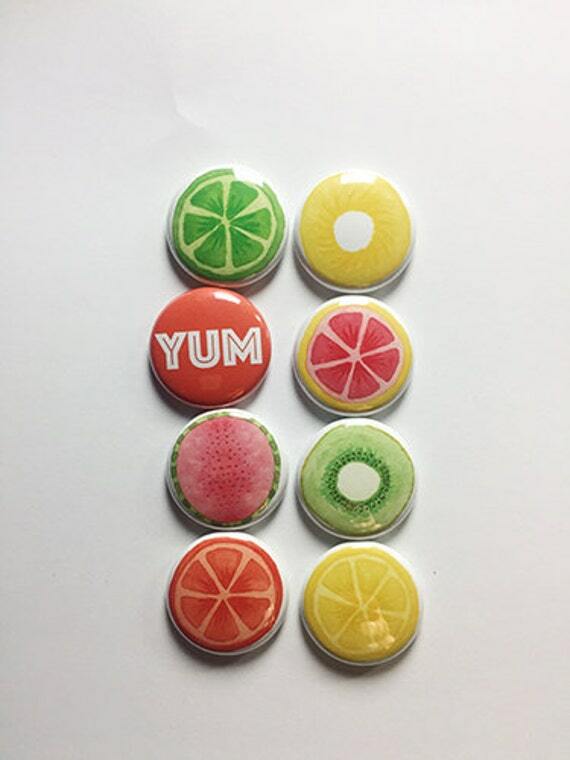 I love tropical fruit slices so this one of my favorite badge sets ever!